The 'I Want You So Hard' hitmakers were forced to pull out of their European tour at the last minute last month after Jesse Hughes injured his finger, but it seems they're making up for it by adding another leg of North American dates. The group - consisting of Josh Homme, Dave Catching, Matt McJunkins, Eden Galindo, Jorma Vik and Jesse - will kick off their new batch of shows on May 17 in New Orleans and run into July. From there, they will head back across to Europe in August for their rescheduled gigs and have promised disappointed fans that their performance will be "stronger" than ever. Jesse said at the time: "I'm devastated that we cannot continue what has been a life-changing return to Europe, but I need to get repaired so we can continue to play rock music around this beautiful world, including coming back to Europe even stronger in the summer." The cancellation was the second blow for European fans as the band also postponed their original tour last November following the terrorist attacks in Paris, during which their concert at Le Bataclan theatre was stormed by gunmen. 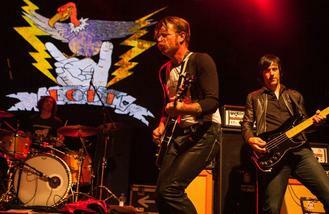 But, for the meantime, Eagles of Death Metal are set to head Down Under for a week-long trek across Australia. They'll then set up in Canada - with shows in Vancouver and Toronto - before kicking off the North American leg.